You might pass a Sutherland shepherd without a second glance on one of his rare days off in Inverness or Thurso, except to note that he (or she) looks fitter and leaner than is the norm in this increasingly obese society. You would look twice, however, if you were presented with their job description. “The successful applicant must be fit and energetic and enjoy outdoor life. 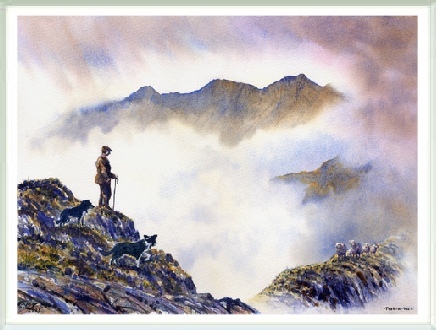 They must have a strong back and knees, have a good head for heights, and be competent hillwalkers and scramblers. They should be able to navigate in poor conditions and be better than average at weather forecasting. They must be good with animals, have reasonable practical veterinary and mechanical skills, and be self-motivated and able to show initiative in working alone or adaptability to work in a team. They must have a good command of English to enable effective communication with the stubbornest dog or government official, ability to complete incomprehensible forms, and limitless patience. They must be able to manage with little or no sleep, be content with remote and basic living conditions, and expect little or no financial reward.” Wow!